When I was growing up, I was quite proud of my heritage. I was one half Norwegian, three-eighths German and one-eighth Danish. If I were to do the math on my children's heritage, it would be much harder. The melting pot has been stirred up again and again so that I would be dealing in fractions of sixteenths and thirty-seconds. My dad's mother, Grandma J, was the child of Norwegian immigrants. All of her life, my Grandma spoke in Norwegian with her brothers and sisters. I never met her father, my Great Grandpa, but I did visit with my Great Grandma a few times, and she did not speak much English. 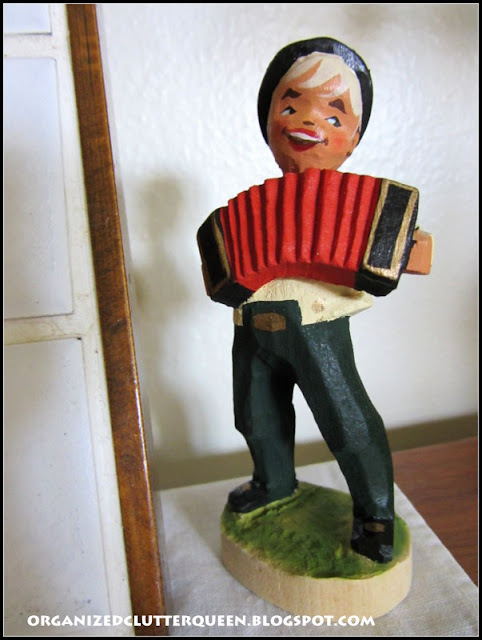 A couple weeks ago I attended an estate sale about a block and a half from my house, and picked up these delightful little wooden figurines for $4. 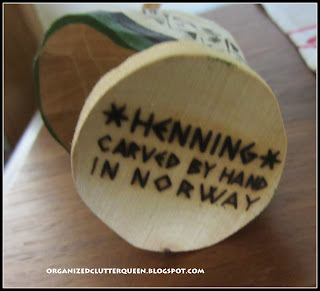 Nothing says "Norwegian" like Henning hand carved wooden figurines. Keeping with the Norwegian theme, here is a trivet that was made from a Suzanne Toftey tile, Krum Kake Girl. I bought it at a consignment shop for $4. My Grandma wasn't a big Krum Kake maker, but she made a ton of Fattigman. Finally, my Mom just gave me this vintage linen that I think is also Norwegian, but of course I can't translate it. Feel free to offer the translation in the comments section. How many of you are of Norwegian descent, like me? Just today and tomorrow left in my Ramsign Giveaway. I love all of these. The wooden characters are so nice. I love the faces. I love things like this. I am from a melting pot as well. I really don't know much at all about my heritage. Long story. I know I have French in me. My mother's maiden name is St.Cyr. Other than that, don't know. I'm Norwegian! 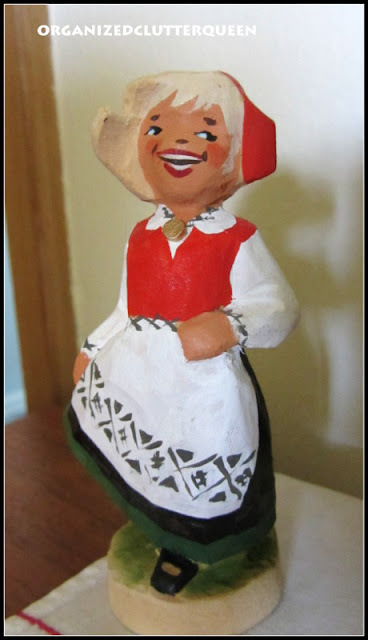 Or at least, a part of me is... my grandmother is of Norwegian descent and she loves these little dolls! I'm not Norwegian , but i do love those adorable characters. 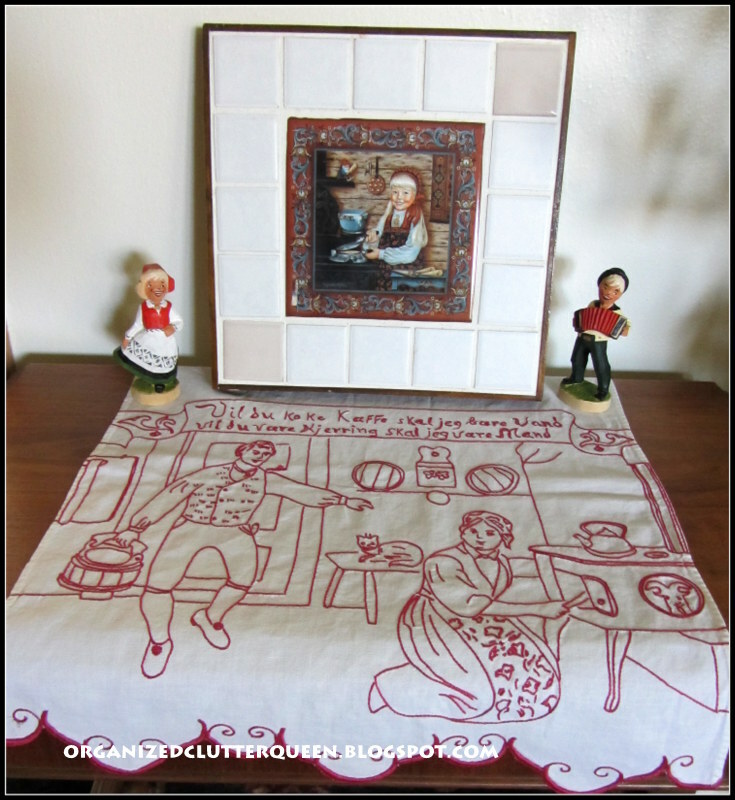 How fun to have items to represent your heritage ! 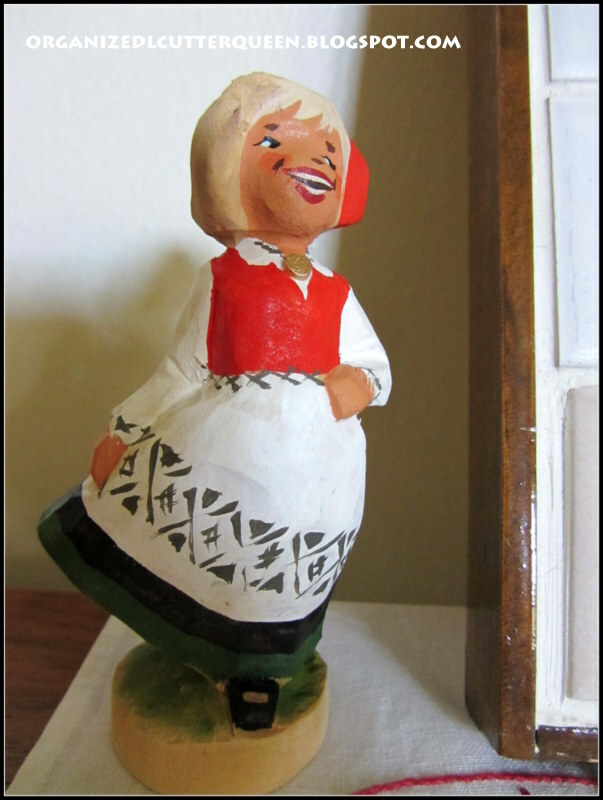 No Norwegian in my lineage -- I have a Polish heritage. 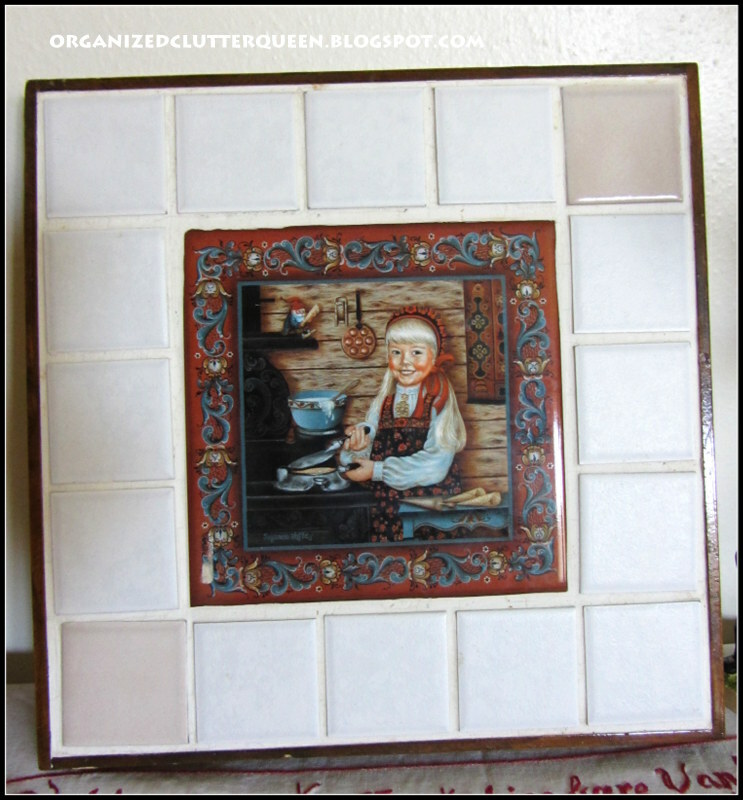 Love the trivet -- such a sweet face on the little baker. 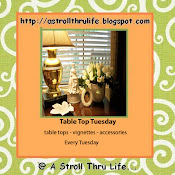 Visiting from You're Gonna Love It Tuesday. I have some Norwegian in me! And Scottish, and Welsh, and German, and...well get it. I am one big melting pot :-) Which means I get to celebrate any holiday I want lol! Your treasures are just that. And so sweet too. I love the linen the best! Thanks so much for sharing at the party Carlene! No Norwegian here, but I love that your found these things. 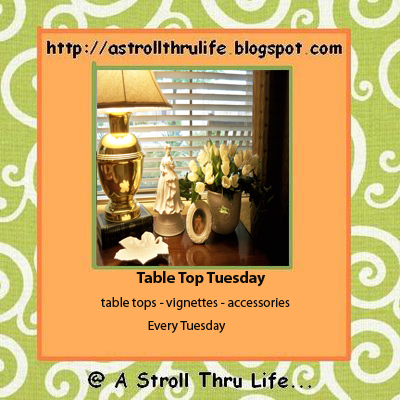 Love what you found, Carlene! No Norwegian - all German! I do ancestry research I find that it fan be fascinating! 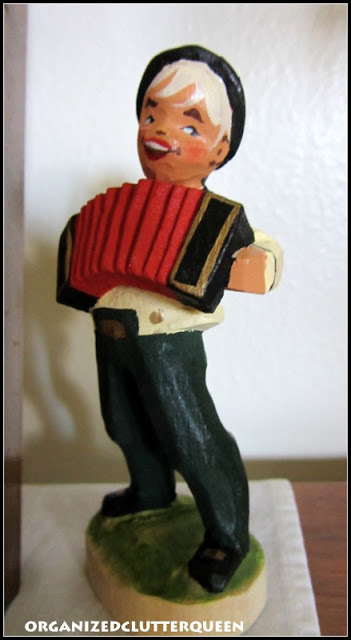 Lovely pieces that celebrate your heritage. You will get a loose translation of what those words mean. It gives options of going to each word and possibly an alternate meaning for each. It just came up with: you will make the coffee I'll just walk will last a woman should I care Monday. I know some of those words can be interchanged with others they have on the site and make more sense. Hope this helps a little. My husband is 1/4 Norwegian and 3/4 Swedish, so our kids are 1/2 Scandinavian. I'm a huge mix with a tiny bit of Swedish, but no Norwegian. I love all your finds; I collect Swedish items too. I would include Norwegian too, but I have never found any. 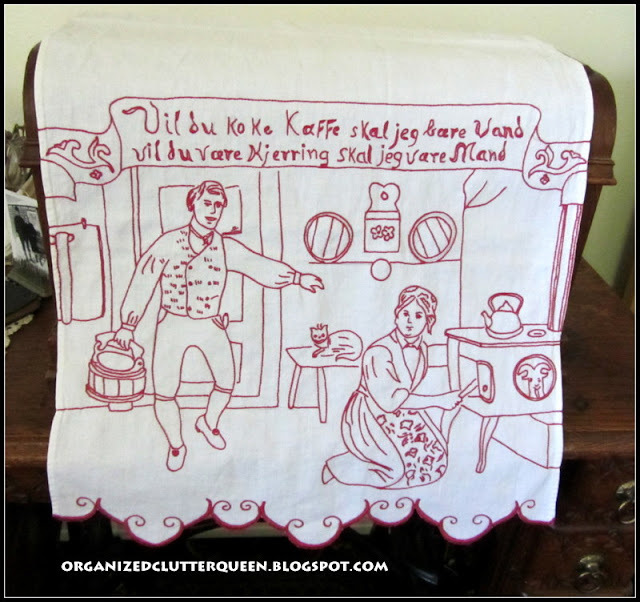 Maybe it says, "After I make his darn coffee,I'm going to figure out how to stuff him in the stove.I hate Mondays."